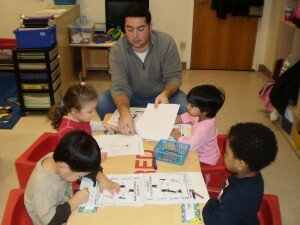 Marcus Avenue provides educational and therapeutic services to preschoolers with a disability, ages 3-5, in need of self-contained classes in a center-based setting. This program provides services in classes with up to six, eight and ten children. Each class has a certified special educator and two certified teacher assistants. Each student’s Individual Education Plan (IEP), along with The New York State Learning Standards and curricula such as The Creative Curriculum, guide the instructional process. In addition, and depending on the needs of the students and the goals on their IEP, other educational and therapeutic curricula may be used to augment the instructional and intervention process. Additional curricula may include those designed to address the needs of children with autism spectrum disorder as well as those with delays or disabilities in speech-language development, fine and gross motor development as well as concerns related to social and emotional development. Specialized instruction and therapeutic intervention is also available for students with multiple disabilities and health needs. Positive reinforcement along with redirection and behavioral modeling is used to promote appropriate behavioral development. Classes are designed to reflect the unique and particular goals and attributes of the students assigned to that room, whether the child has particular health issues, is multiply disabled, is challenged by autism spectrum disorder or has other needs and skills.